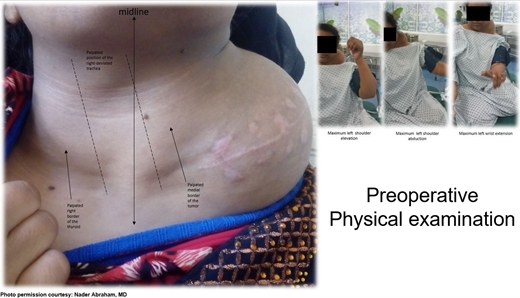 An 18-year-old primigravid Bedouin woman was admitted for resection of a 15 × 10 cm symptomatic, deforming solid mass fixed to her neck and left shoulder girdle. Past medical history revealed a 1 × 1 cm dormant nodule, felt in her left sternomastoid, which grew explosively during her first pregnancy and stopped abruptly after delivery, with no history of major antecedent trauma. Physical examination showed limited abduction of her left shoulder, left arm weakness, forearm numbness, numbness of the three medial fingers and left wrist drop. 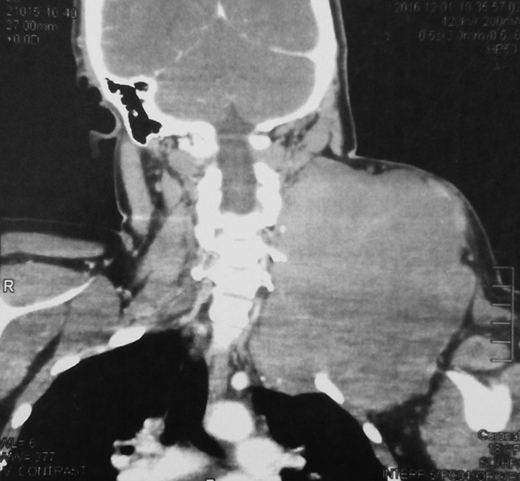 The tumor extended deeply medially into the neck causing right-sided deviation of the thyroid and trachea, with associated dysphagia to solids, but no change in voice. CT scanning revealed a mass attenuation inseparable from the paravertebral muscles extending into the left apical pleura. MRI discerned that the tumor was not pressing on the brachial plexus, but rather infiltrating it. Pre-operative core-needle biopsy demonstrated a benign spindle cell neoplasm, consistent with a desmoid tumor. Immunohistochemical staining for estrogen receptors demonstrated a moderate positive reaction of most of the neoplastic cells. The patient underwent en bloc resection by dissection from the overlying skin, left internal jugular vein, left sternomastoid and trapezius muscles, left first rib, left apical pleura, and the left paravertebral muscles and cervical nerve roots. The tumor-encased brachial plexus was unsalvageable. The incision closure included revision of the scar of a recently failed resection and insertion of a closed suction drain. Pathological evaluation of the excised tumor confirmed a 15 × 10 × 9 cm, non-encapsulated tumor with several enlarged, reactive-type cervical lymph nodes. The patient’s postoperative course was notable for paralysis of the left upper limb, and a Chyle leak (trauma to the thoracic duct) through the drain, which stopped spontaneously 10 days after the operation.